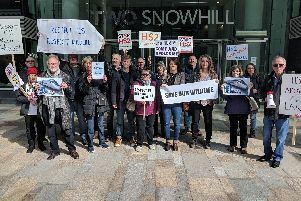 These events are intended to allow people in the community to speak with HS2 representatives but have recently also been used by anti-HS2 campaigners in Aylesbury Vale to let their voices be heard. Two weeks ago we reported live from a passionate demonstration in Calvert Green. Steeple Claydon was a quieter affair, used primarily by campaign group 'Anti-HS2 – SOC (Save Our Countryside)' to gain signatures for their petition. At the Steeple Claydon event, Councillor Charlie Clare informed this paper that he was made aware, albeit indirectly, by HS2 that they were planning to postpone the vegetation clearance due to Southern Gas Network (SGN) pulling out of an agreement to share one of their depos with HS2 following the protest in Calvert Green. Another anti-HS2 campaigner also informed this paper that they were approached at the event by HS2 representatives asking the group to back off because they had agreed to delay the vegetation clearance. Clearly not all these things can be true. As yet we have been unable to ascertain which parts are false. 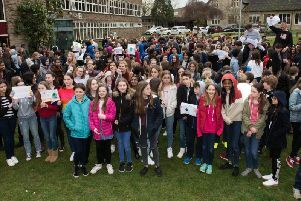 Along with the strange described above, 596 people turned out in Steeple Claydon to lend their support to the petition which specifically expresses grievance at the way HS2 has communicated local vegetation clearance. It is planned that the petition will be delivered to HS2 CEO Mark Thurston in person on Wednesday 20 March.